Sitting in silence before the Lord for any length of time may be the greatest challenge in the spiritual life that we face today. In a busy world, making time for visiting Him may seem like an impossible task, but it can be accomplished. If you desire to spend an hour with the Lord, you must always give up something else first. However, what you receive in return from the Lord is much greater: His friendship. In reflecting on the lives of the saints, we understand that prayer before Our Lord in the Blessed Sacrament was the very thing to help mold them into saints. They were all in great friendship with the Lord. We too can be friends with the Lord, and grow in holiness by spending time with Him in His Eucharistic Presence. What will you give up in order to spend more time with Him? Our parish is blessed as we move into the eighth year of Eucharistic Adoration on Thursdays. Many faithful Adorers have sacrificed their time in prayer through the years for the greater good of the parish and world. Thank you! How do you feel about spending time with Our Lord in Eucharistic Adoration? The Lord graciously visits with us during the Exposition of the Blessed Sacrament every Thursday following the 8:00 a.m. Mass, and ending with Benediction just before the 7:00 p.m. Mass. Do you truly desire Jesus to be the magnet of your soul? If so, make a firm “spiritual resolution” in 2011 to “Come and Adore Him” in the Real Presence of the Blessed Sacrament. It has been the consistent belief of the Catholic Church from the very beginning that the bread and wine consecrated at Mass truly become the Body and Blood of Christ; and that, furthermore, as the Catholic Catechism states, this “Eucharistic presence of Christ [which] begins at the moment of the consecration...endures as long as the Eucharistic species subsist.” (CC #1377). In other words, the Eucharistic Christ then continues to be present in our midst beyond the Eucharistic liturgy when the consecrated host is either reposed in a tabernacle or exposed on the altar. If we can adore the Eucharistic presence of Christ when reposed in a tabernacle, why do we then need to expose the Blessed Sacrament on an altar? People report experiencing a greater sense of intimacy with Jesus and attentiveness of mind and heart to prayer when they are able to actually “see” our Eucharistic Lord. The best reason for having exposition of the Blessed Sacrament is simply that God wills it. During His Eucharistic discourse, Jesus made this unmistakably clear: “Indeed, this is the will of My Heavenly Father, that everyone who looks upon the Son, and believes in Him, shall have eternal life. Him I will raise up on the last day” (John 6:40). – taken from Pope John Paul II Eucharistic Adoration Association. Adorers spending time in weekly Eucharistic Adoration has resulted in numerous blessings for our parish. Greater blessings await us! It is important to note that Our Lord’s humble invitation to spend time with Him in ‘Adoration’ is not for a select few but for all parishioners. 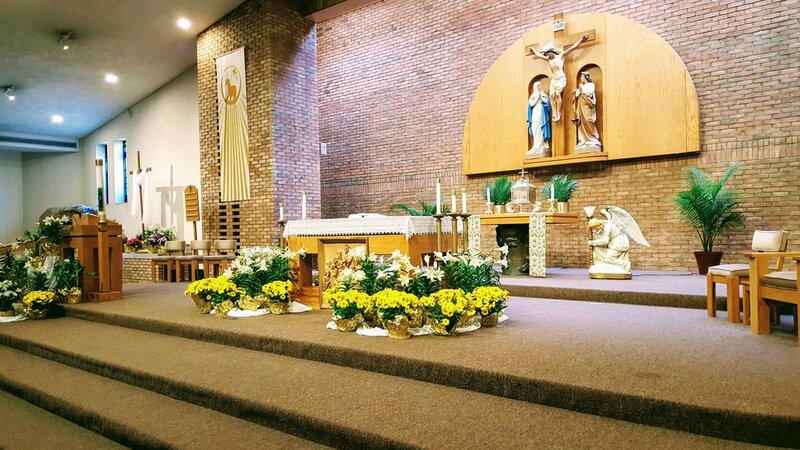 Outside of attending Mass, many adorers find that spending an hour in Eucharistic Adoration is the most satisfying and peaceful hour of their entire week. Our Lord undeniably thirsts for you and me. He thirsts for all members of St. Patrick parish. How can we alleviate Our Lord’s fervent thirst for souls? Respectfully consider attending Thursday morning Mass at 8:00 a.m., staying afterward to spend some time with Him. Spiritual materials are available in church to make our Holy Hour more meaningful. Eucharistic Adorers often pray the Holy Rosary, Divine Mercy Chaplet, read from Sacred Scripture, and/or just have a good heart-to-heart talk with the Lord. Jesus loves the little children. In a world full of distractions, they need to experience the Lord’s love for them during Eucharistic Adoration. Our children are the future of the church: saints in the making. Families can attend Benediction and/or stay for evening Mass. Confession is available. May He find us not wasting time on the frivolous, instead seeking our true treasure on earth: The Real Presence of Jesus Christ. Challenge yourself in 2011 to spend more time with Him. His love, peace, and joy endlessly await you! "Eucharistic adoration is the greatest of actions. To adore is to share the life of Mary on earth when she adored the Word Incarnate in her virginal womb, when she adored Him in the Crib, on Calvary, in the divine Eucharist,"
The Magi followed that wondrous star, leaving their native country to seek the newborn king. Through Sacred tradition, we believe the Magi to be Caspar, Melchior, and Balthazar. In our own spiritual journey, how can we emulate the Magi to bring Him gifts of gold, frankincense and myrrh? St. Therese of Lisieux, Doctor of the Church, or simply known to many as the “Little Flower” realized early on in life that the most authentic gift we can bring to the Christ child is the gift of self. Through her “Little Way”, a path of trust, we learn that as we humble ourselves before the Lord, our selfish desires decrease, and we allow the “grace of God” in us to increase. She points out “What we ask of him is to work for his glory, to love him, and to make him loved” (Letter 220). Finding Him, the babe in swaddling clothes is sometimes difficult. We must sacrifice, and often leave our native country or comfort zone. Traveling with the magi through a dry, barren desert: we are guided by the ‘wondrous’ star that clearly illuminates our path to Him. Seeking truth in the words of the Gospel is a brilliant light that shines, and available to all of humanity. On our journey of discovery, there are many inconveniences. However, perplexities in life always remain secondary to genuinely finding and “adoring” the Christ child. In the refrain of Adeste, fideles a popular, 18th century Christmas Hymn we hear: R. Venite, adoremus, venite, adoremus, venite, adoremus Dominum. R. O come let us adore Him; O come let us adore Him, O come let us adore Him, Christ the Lord. How can we truly adore Him? We need to bring Him our “gift of self”. Following on a ‘path of trust” requires self-abandonment. It asks us to prostrate ourselves in humble veneration before the Lord. Seeking to please the Lord often means losing human respect from the world. The Magi did not let this lack of humanly affection impede their arduous journey to visit the Christ child, nor should we. Leaving St. Joseph, Our Lady and “baby Jesus” in the quiet and comfortable surroundings of the stable to go back into the world is something the Magi had to face. This is a challenge for all Catholic men and women of faith. Where do we go and “adore” Him now? Did the Magi leave the stable never to adore Our Lord every again? Practicing the Corporal and Spiritual Acts of Mercy in our lives allows us to follow Christ’s call to be the “light of the world” for all in darkness, especially for the poor and suffering. They depend on our prayers and good works. What better way is there to perfect our good works for the poor and suffering then through prayer? We too can adore” Our Lord by spending time in prayer with Him in the Real Presence of the Blessed Sacrament. Let us now bring Him gifts: the gold of charity, incense of prayer and myrrh of penance and mortification. May our Holy Father, Pope Benedict XVI be the “wondrous” star that faithfully illuminates our path to Him. Pope Benedict XVI states the importance of Eucharistic Adoration in the life a parish in his Post-Synodal Apostolic Exhortaion, SACRAMENTUM CARITATIS. 67. With the Synod Assembly, therefore, I heartily recommend to the Church's pastors and to the People of God the practice of eucharistic adoration, both individually and in community. (194) Great benefit would ensue from a suitable catechesis explaining the importance of this act of worship, which enables the faithful to experience the liturgical celebration more fully and more fruitfully. Wherever possible, it would be appropriate, especially in densely populated areas, to set aside specific churches or oratories for perpetual adoration. I also recommend that, in their catechetical training, and especially in their preparation for First Holy Communion, children be taught the meaning and the beauty of spending time with Jesus, and helped to cultivate a sense of awe before his presence in the Eucharist. Here I would like to express appreciation and support for all those Institutes of Consecrated Life whose members dedicate a significant amount of time to eucharistic adoration. In this way they give us an example of lives shaped by the Lord's real presence. I would also like to encourage those associations of the faithful and confraternities specifically devoted to eucharistic adoration; they serve as a leaven of contemplation for the whole Church and a summons to individuals and communities to place Christ at the centre of their lives. All parishioners are invited to spend time with Our Lord in Adoration of the Blessed Sacrament on Thursdays after the 8:00 a.m. mass until 6:50 p.m. Benediction and Holy Mass follow at 7:00 p.m. Please feel free to stop in any time to visit Our Lord to say hello. If you would like to sign up for a Holy Hour please call Kathy at 926-8695 or email kathleenmiller2 azATza verizon azDOTza net Adorers are always welcome, and VERY MUCH NEEDED!